So, faced with a rather undersized original kitchen footprint of less than 100 square feet (with an adjoining dining room that bumped the square footage to less than 200 feet), the couple looked to build a minimalist design theme with an industrial loft feel. They paired IKEA SEKTION cabinetry framework with IKEA’s VEDDINGE wall cabinetry and base cabinetry with IKEA LANSA handles and UTRUSTA hardware throughout. Those products were combined with Caesarstone Pebble Light Grey Quartz countertops purchased from IKEA as well as a unique backsplash featuring gray and white Moroccan tiles. Even more impressive than the final results is that Jordan primarily designed the space himself– even studying proper lighting temperatures and bulbs for the kitchen lighting. “We used IKD as a service to make sure that what I came up with made sense, because I’d never designed a kitchen before,” he says. “IKD was very helpful in order to interface with IKEA and its products and system, as well as pointing out when I needed to add inches and product and also with generating the design specs,” he concludes. IKEA cabinetry was simply the right fit for this kitchen. medium-colored parquet flooring and gray tiles and were completed by IKEA FORBATTRA side cabinetry cover panels. “We wanted a sleek, minimalist look in our space,” he says. However, it also needed to be functional. And although the overall footprint of the kitchen is small, the ceilings stand between 10’6” and 11’ high and undulate, which gave the couple options.“The space has no closets, so the only storage is what we built. We realized that with these ceilings, we should double up the cabinetry,” he describes. Likewise, SEKTION base cabinetry was combined with IKEA MAXIMERA drawers for additional storage options. He also notes that with a young baby, it was important to pick products that cleaned easy and still looked good. 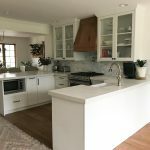 Therefore, he complemented the cabinetry with Caesarstone Pebble Light Grey Quartz countertops around the L-shaped cooking prep area and bar top, while opting to keep the original white appliances. He had several contractors do the demolition, install and prep, which lasted from May until July. “We also had a contractor do the tile work. So far we’ve been really pleased with it all,” he concludes. Complicating the layout was an eight-foot partial wall that blocked off the kitchen from the rest of the space.“The challenge was needed to cut that wall in half and turn that into a bar top. So we had to get all the cabinetry pulled out, cut this wall in half and install new kitchen cabinetry,” Jordan explains. He continues: “We actually ended up living through construction with a small baby but it worked out.” He points out that in order to get that work approved, he needed architect’s plans, which he secured from architect Andrea Solk, and used as further design inspiration. While the loft has natural lighting, Jordan also researched various lighting elements. Jordan offers advice for anyone starting an IKEA kitchen remodel. 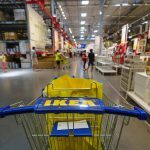 “Go to IKEA during off hours, and try to make your trips surgical. I ended up making far more trips to IKEA than I ever wanted to make!” he says. He quickly adds that he gets great compliments about his IKEA kitchen, and credits IKD’s design team for keeping him organized. “My overall experience with the IKD designers was good and working with IKD worked very well because we had a strong sense of what we wanted. It was helpful having someone looking over my shoulder to make sure that I wasn’t screwing up measurements or missing details. IKD was the best at nailing down the details regarding materials. That, and the physical drawings that I used to talk to the contractors were great,” he concludes. As professional IKEA kitchen designers, we know that cabinet lighting must be planned for while designing a kitchen, and never treated as an afterthought. IKEA’s cabinet lighting systems aren’t as complicated as they seem. Most folks just don’t understand electrical jargon and IKEA’s product names. In Part 1 of this series, we’ll explain a few basics that will help you understand how IKEA’s cabinet lighting works for your kitchen. What’s the electrical situation in your kitchen? Big consideration: Can you add outlets or junction boxes before you install the cabinets? To determine which IKEA lighting system you’ll use, we’ll need to know if you’re able to connect the wiring for your lights directly to an electrical junction box? What kitchen areas do you need lighted? Do you need or want countertop lighting from along the bottom of all wall cabinets, or just a few? How about lights inside your wall cabinets, and/or lights inside your base cabinet drawers? Which IKEA lighting system is best for you? Most IKEA customers work with either the UTRUSTA or OMLOPP lighting systems. The UTRUSTA is hardwired (connected directly to your homes’ wiring). The OMLOPP system is plugged into an ordinary electrical receptacle. • Light up all your countertops and lots of wall cabinets: Use the UTRUSTA system, direct-wired. Locate the junction box(es), connect and install the UTRUSTA countertop light tracks along the bottom of all the wall cabinets. Connect the OMLOPP in-cabinet spotlight cables to the UTRUSTA tracks ports. No transformers are needed. • Electrical outlets and to charge your phone: Insert UTRUSTA’s two outlet power strips within the span of your UTRUSTA countertop light tracks. Outlets and USB ports are out-of-sight, along the back of the wall cabinets. Designers’ insights: Try to work with UTRUSTA, if possible: no ugly transformers and less wires. • Countertop lighting and wall cabinet lights: Use the OMLOPP system, plugged into an outlet above your wall cabinets. Place countertop track lights, where needed, and run each cable to a transformer sitting on the top of the wall cabinets. Run each in-cabinet spotlight cable up to that same transformer, and plug in. • Light up your drawer interiors: Use the OMLOPP drawer light strips for the drawers you want illuminated. Place electrical outlets in a nearby base cabinet, then connect the lighting strip cables to a transformer, and plug in. Designers’ insights: When just a few lights are needed, then OMLOPP is faster and easier. Mounted below the wall cabinets. Controlled by an ANSLUTA remote control. In the case of UTRUSTA: direct-wired and connected in series. For OMLOPP: plug-in and each strip is independent, not connectable. Mounted on top of the wall cabinets. Provides general kitchen and wall cabinet lighting. They can connect to either the UTRUSTA worktop lighting or the OMLOPP transformer. Mounted inside wall cabinets. Attached to the bottom of shelves or the top of the interior of a wall cabinet. Provide interior cabinet lighting. They can connect to either UTRUSTA worktop lighting, or an OMLOPP transformer. Mounted inside cabinets with drawers; either along the top front or sides. Individual drawers can be lit. Lights work with motion detectors. The cable for each strip runs to a transformer that’s plugged into an electrical receptacle. As designers we know the value of well-coordinated kitchen lighting. You’re able to find stuff easier; in particular, inside the drawers. 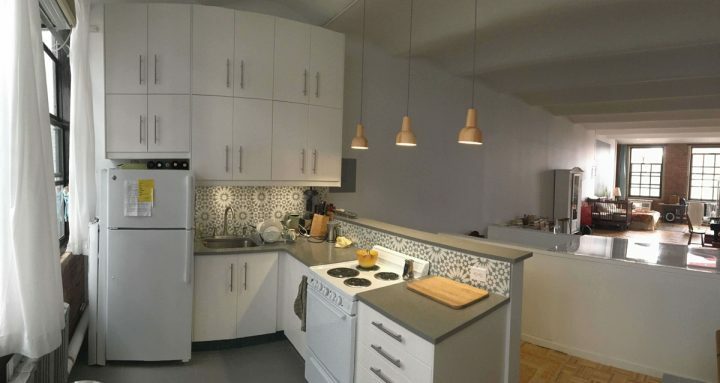 But what we really like is the kitchen ambience with just cabinet lighting. It’s so much nicer than just overhead lighting. Look for Part 2, where we will explain more about IKEA’s key lighting components and their uses!